Following yesterday’s budget, we have produced our Budget Summary 2015 document which highlights the main changes announced by the Chancellor. This will quickly bring you up to speed and hopefully be a lighter read. Please click the image below to download your copy. Written in plain English, we have broken the summary down into the main areas of taxation, including personal tax, business tax, employment tax and capital tax. We have also included comments on the more important changes, together with any planning points that may arise. 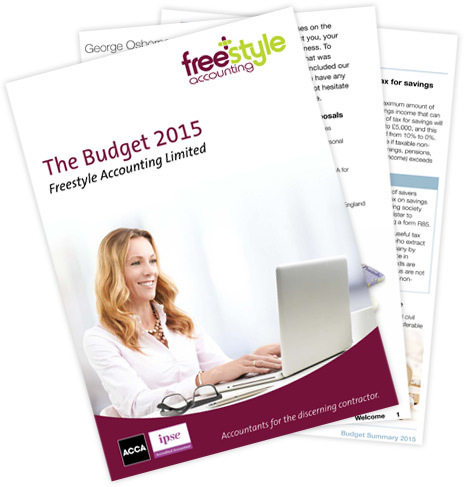 If you have a question concerning any of the issues covered in this summary, or would like advice on the best possible course of action in a particular area, please contact us on 0800 954 2101 or by emailing us at tax@freestyleaccounting.com.